What are Italian scientists interested in? Would you believe American baby names? Meet researchers from Sapienza University in Rome. They used our Social Security archives to analyze American baby names from 1910 to 2012. Cultural trends like naming babies seem independent of socioeconomics, but possibly indicative of other social forces. The researchers found that, like infections, baby names get popular fast, peak, and then fade to a low background level. Not surprisingly, popular names tend to spread regionally. The team colored maps of the U.S. to show how names were distributed. 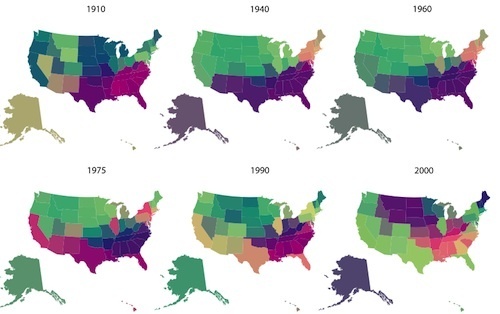 So in 1940 the entire South was shades of purple. The whole north was shades of green. Each had their own regionally similar name distributions. But by 2000, the Southern block had shrunk. The Midwest was its own block. And the Southwest and West Coast had grown similar. The Italians say it’s up to others to explore what the changes mean. As for why anyone names their baby Ozzie? More research is needed.